Below is an interactive map of our trip, tracked using my Trimble Outdoors Navigator iPhone app. You can zoom in, or click the link above for a bigger, fullscreen map. This blog contains a sampling of the photos from our trip. To view all of the photos from our trip, view the slideshow at the bottom of the post or visit our Road Trip Memories page on Flickr at the link below. 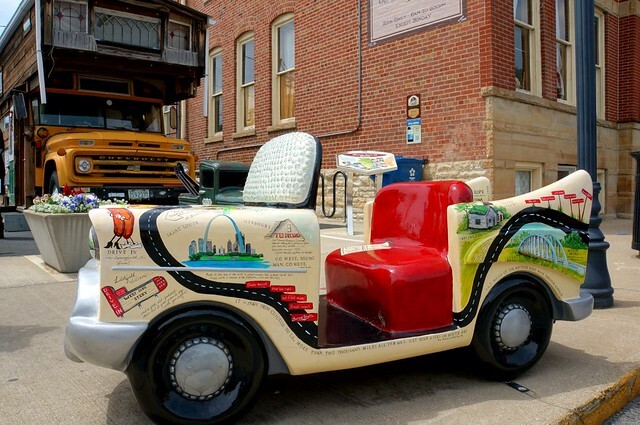 Long story VERY short, a change in plans allowed us to be able to attend the 25th Illinois Route 66 Motor Tour. We had been on the tour several times before, but don’t always have a chance to attend. But when we do, it’s always a great time! 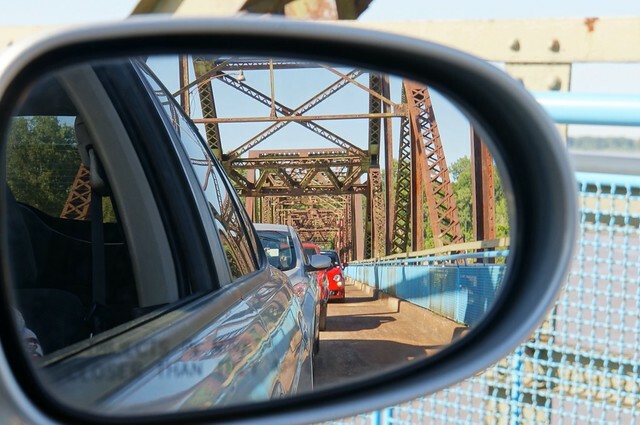 After a rocky start Friday evening, we finally hit the road to head west – we were going to stay in Collinsville and then head over to the Chain of Rocks Bridge in the morning to register for the Motor Tour. 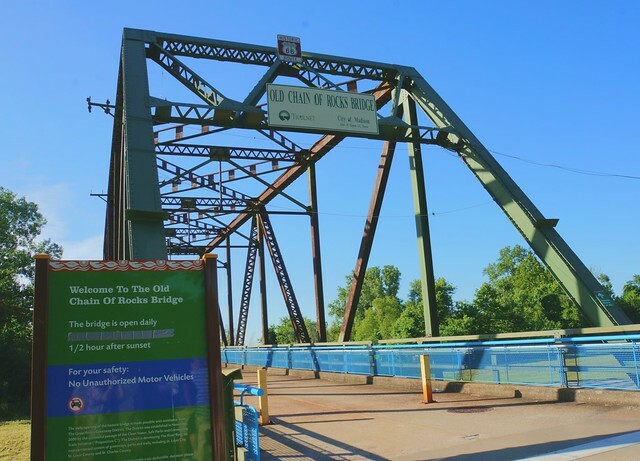 We followed along what was known as one of the alignments called “City 66″ ad described in Jerry McClanahan’s EZ 66 Guide, up to the Chain of Rocks Bridge, where the Motor Tour was to begin. What a sight this truck was! 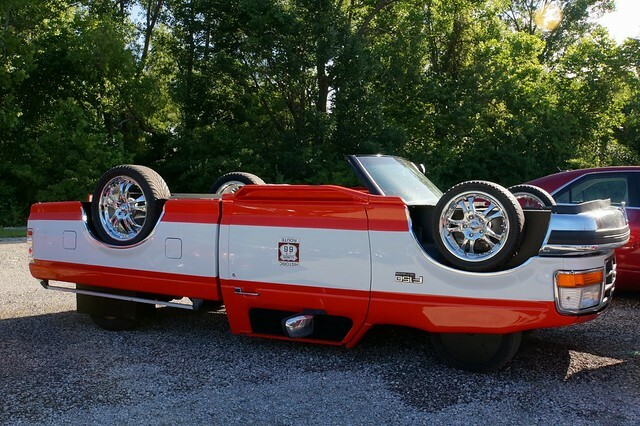 Really unique modification of a Ford truck, lots of folks did a double-take on this one!! 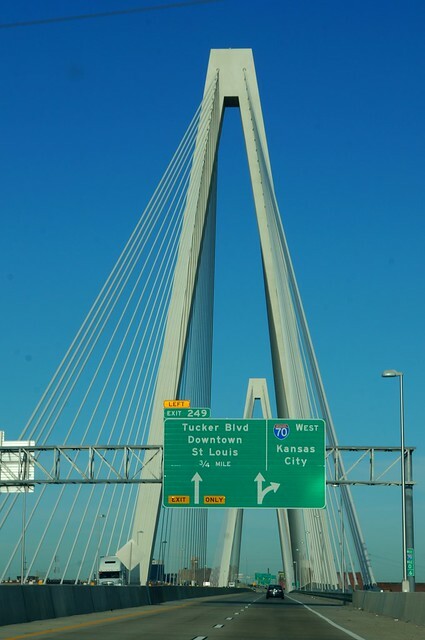 And here we go, crossing the Chain of Rocks Bridge! 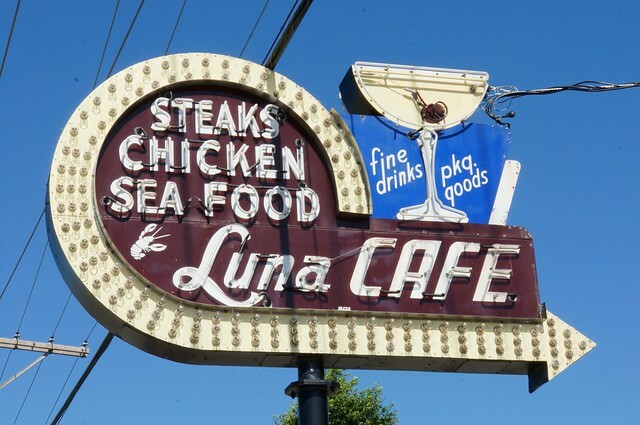 After we crossed the bridge, in Mitchell is the Luna Cafe, with its beautifully restored neon sign. 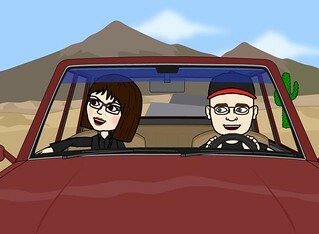 Next, we stopped at Route 66 Ridez in Hamel. Then on to our friend Rich Henry’s must-stop – Henry’s Ra66it Ranch in Staunton. Do stop by and say hello to Rich and the bunnies! 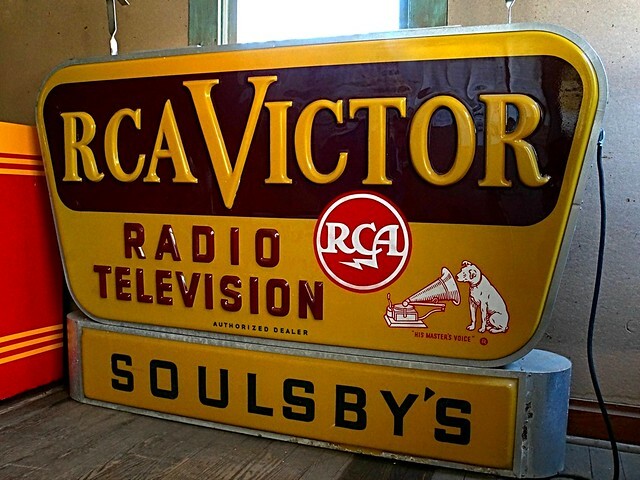 Rich has old neon signs, semis, both “real” rabbits, and the Volkswagen variety too! 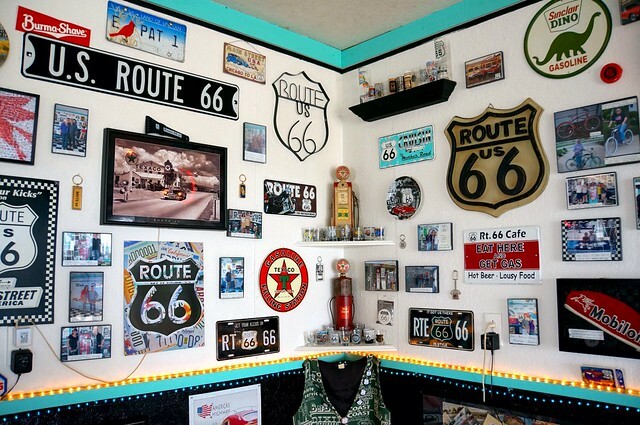 He also sells a nice variety of Route 66 souvenirs, books, videos, etc. I have more photos from the Ra66it Ranch in the slideshow, below. 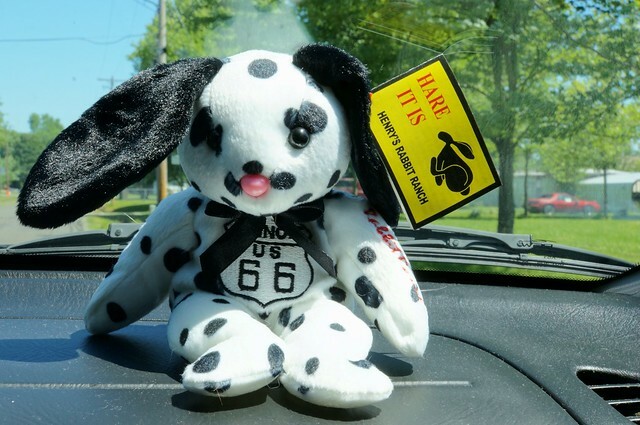 We also picked up a bunny named Spot, a few traveling friend for our grandson! 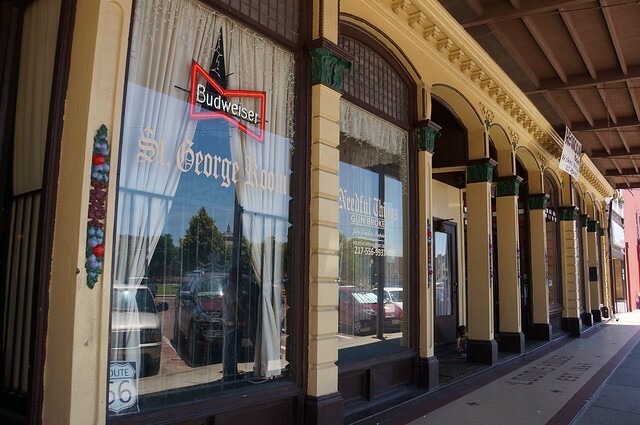 Next stop, Soulsby’s Station in Mt. Olive. 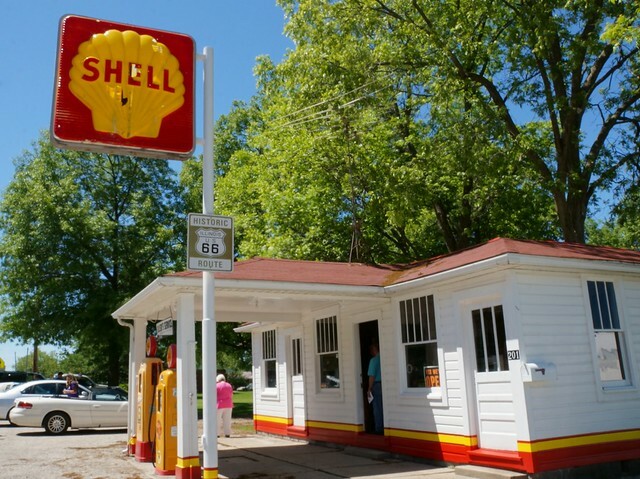 Great restoration of the old filling station, and inside is a nice collection of Shell petroliana as well as two very nice old signs for a TV repair business that was also run out of the station, after Route 66 bypassed Mt. Olive. 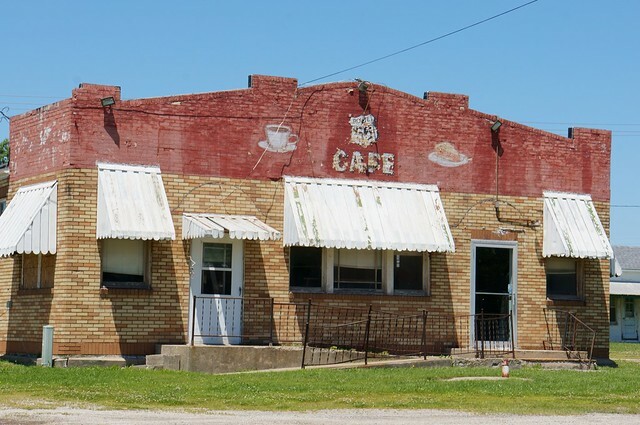 On to Litchfield, where this old cafe sits empty. 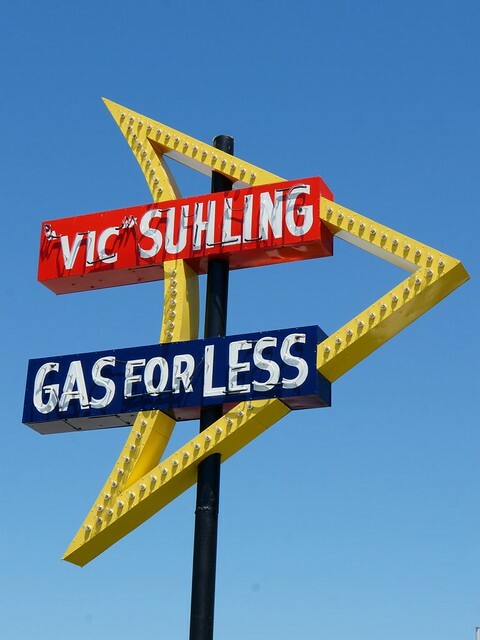 We were able to see the newly restored “Vic” Suhling Gas for Less sign, also in Litchfield. 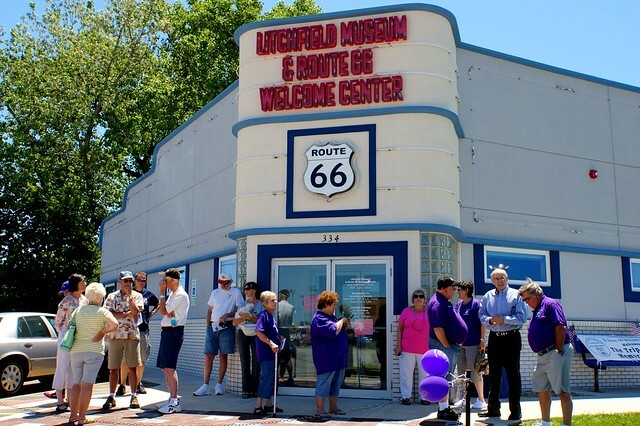 It is now in front of the new Litchfield Museum and Route 66 Welcome Center, and is an excellent stop! See slideshow below for more photos from the museum. 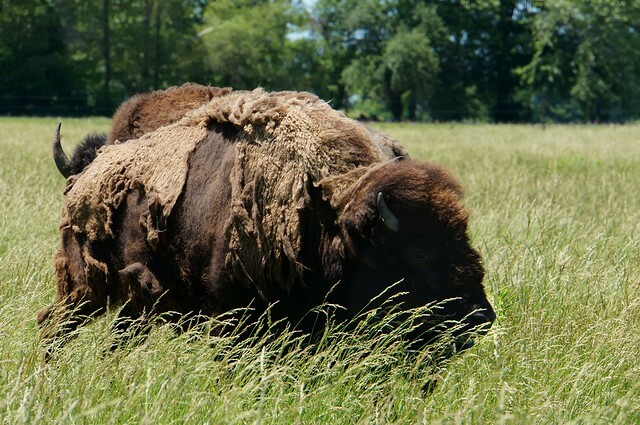 Next, we spotted a few buffalo roaming! Their timing of dipping their heads down into the grass was perfect to avoid my shutter, but I managed to catch one as he came up for air. Then onto the town of Carlinville. Great “town square” with lots of great shops here. We got out, stretched a bit and took a walk around the square. 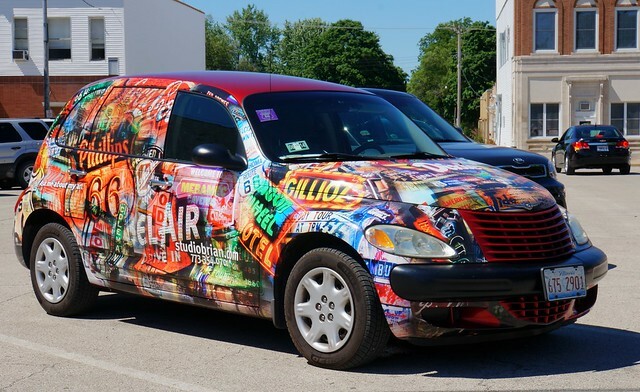 This very cool PT Cruiser was also on the tour, decorated by artist Brian Gregory, who also designed art for the Illinois Route 66 Museum in Pontiac. 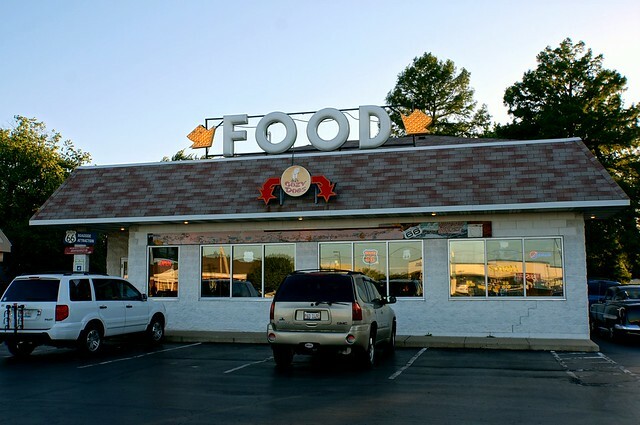 The next day, after obtaining my necessary coffee fix at Mel-O-Cream Doughnuts, we started north. We stopped for a few photos in Williamsville. 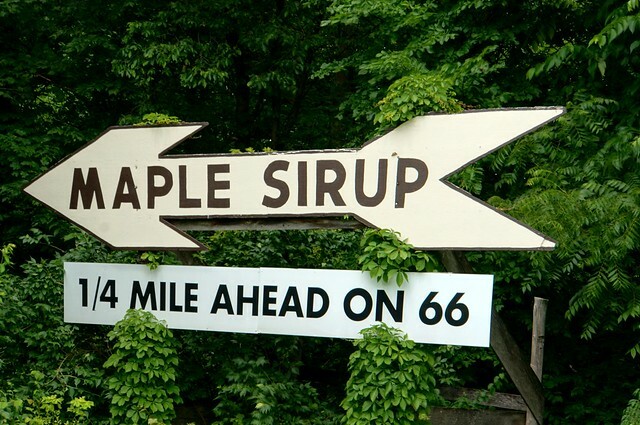 And of course some maple sirup and maple candy at Funks Grove! Our stops in Towanda were interesting. The first was the garage (yes, at her house), of Dawn Patterson. Check this out…it’s pristine. 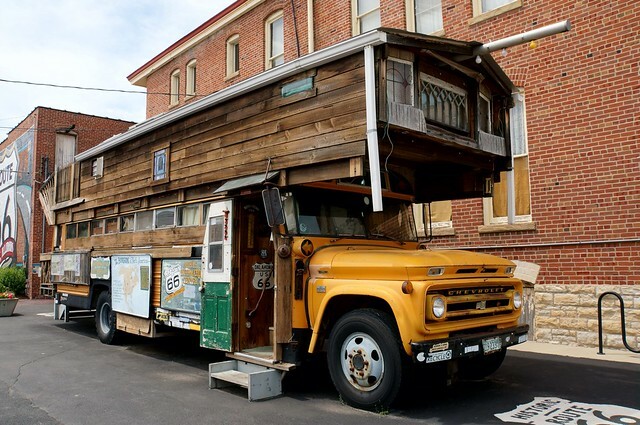 She says she uses it as a garage, but it was decked out in Route 66 memorabilia, and I sure didn’t see any tools or cans of oil! We just built a garage and it has unfinished walls and no electricity. 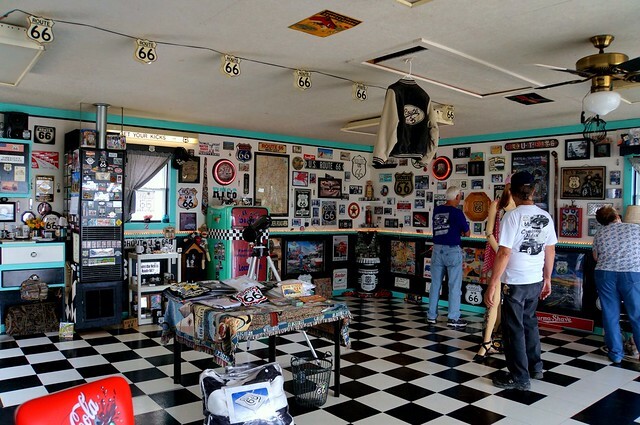 Pat was suffering from severe garage envy! 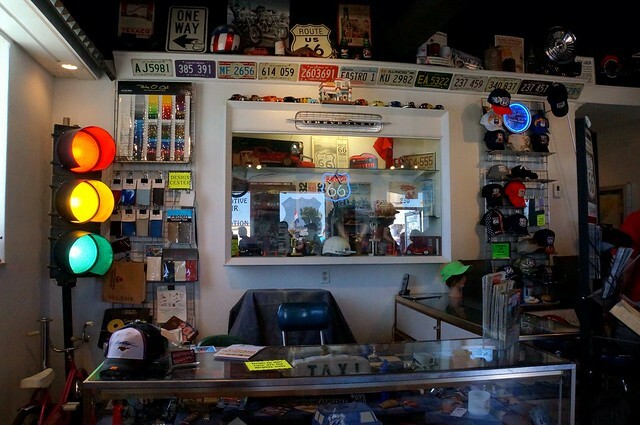 Our next stop was Joe’s Garage, which was in a more commercial building, and houses a very nice collection of motor sports and racing memorabilia. 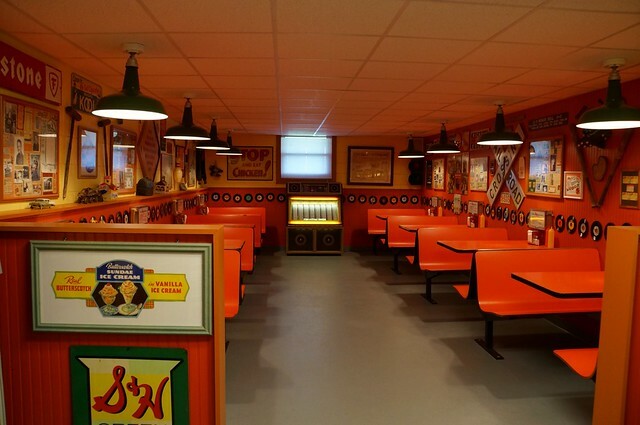 They also have a “diner” recreation built in the building next door. 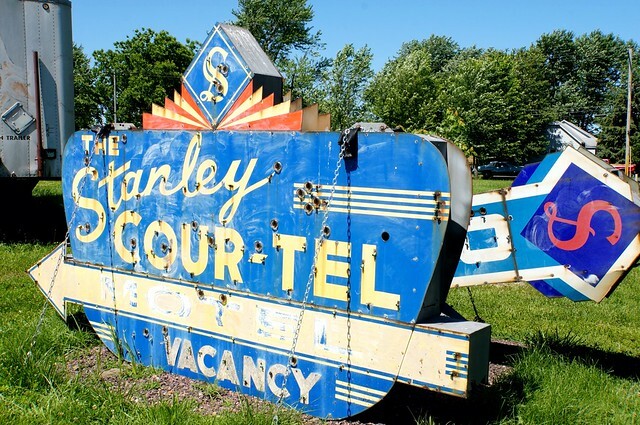 After cruising the old alignment in Lexington now coined “Memory Lane”, were were on to the next stop in Pontiac. We visited the Route 66 Museum, always a great stop. 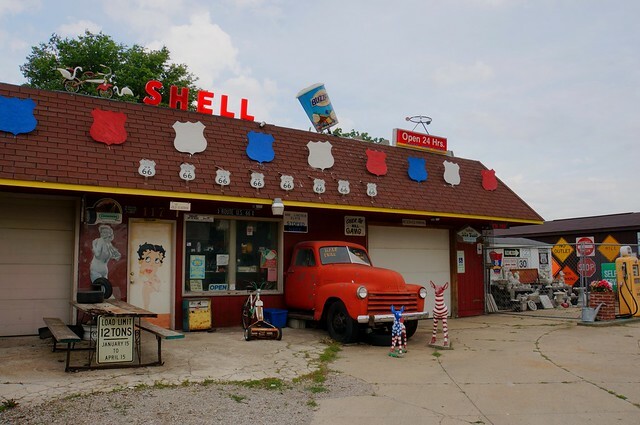 They have lots of Route 66 memorabilia, especially for Illinois – and displays on all of the Hall of Fame inductees. 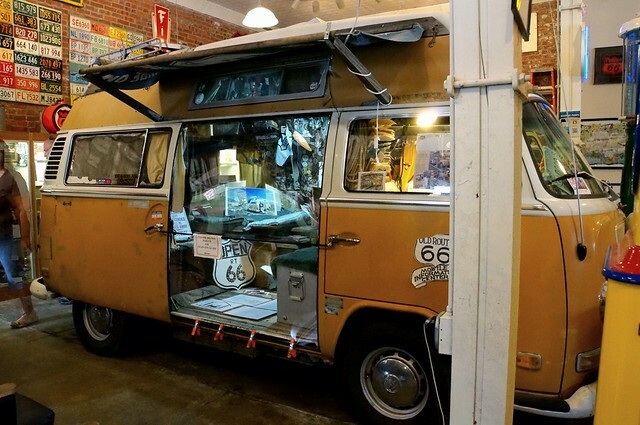 Two newer additions to the museum are a treat – two vehicles owned by Bob Waldmire, legendary Route 66 artist and son of Cozy Dog creator Ed Waldmire. Bob also was the inspiration for the character “Fillmore” in Pixar’s Cars. Across from the museum is also a very nice mural, which is a tribute to Bob Waldmire. 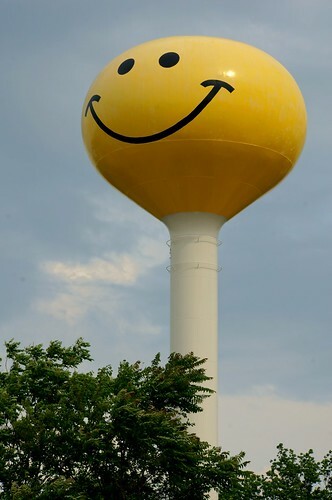 In recent years, Pontiac has commissioned many wall murals around town. Bob Waldmire was asked to design and paint a mural for Pontiac, but unfortunately, Bob was diagnosed with cancer and was unable to do so. But prior to his death, he did design a mural, which would be painted in Pontiac for his friends and family. The very cleverly designed mural features Bob painting the mural. Bob was a very neat individual, and though we could not have been any different from each other, his words of wisdom told to me during the 2006 Illinois Motor Tour have stuck with me – “live simply, and you won’t need a lot of money.” While I will most assuredly not live in an old school bus or VW bus, I can see living in a smaller travel trailer with minimal “stuff.” It’s our dream to travel extensively some day, and I want to live simply so as to be able to realize that goal, and will happily sacrifice a house and material possessions for more Road Trip Memories! 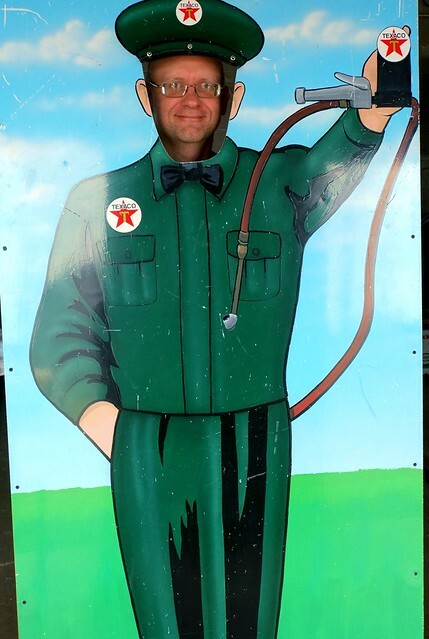 We stopped at the Ambler-Becker Texaco Station, which had a volunteer dressed a Texaco Filling Station attendant, offering neat photo ops. 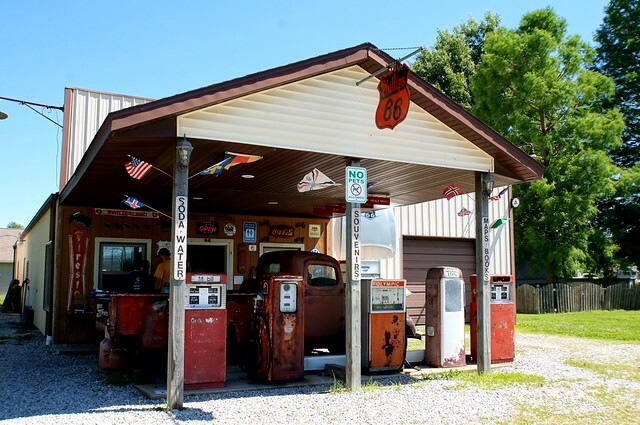 The tour ended in Wilmongton, but we proceeded north through Joliet, Romeoville, and into Bolingbrook where we visited our good friend & fellow Route 66 roadie, Lulu. After dinner, we headed back for home. Below is a slideshow of all of the photos from this trip. Click any photo to stop the slideshow and view the photos on our Flickr site. If you are on an iOS device and do not see the slideshow, please click here to view our photos on Flickr.